My children love board games. I'm always looking for games that meet a few simple criteria: interesting enough that the parents don't want to poke their eyes out, simple enough that my 8 and 10 year old can follow and enjoy, and long enough that I don't have to play five times but short enough that it doesn't take all night to finish one round (ahem, Monopoly). A recent discovery hit it out of the park on all dimensions. I have heard a lot about The Settlers of Catan, but whenever I picked up the box I was always totally intimidated by the elaborate, detailed instructions. So when I saw Catan Junior at our local toy store, I was thrilled. My 8 year old son and I unpacked it, read through the directions, and launched into play. We played for hours and hours. In fact, for a brief, shimmering window, he wanted to play Catan more than he wanted to play Minecraft. The game, about pirates, parrots, islands, and amassing enough supplies (gold, goats, cutlasses, molasses, and wood) to trade for lairs and ships, absolutely captivated my son. I enjoyed it too. It is simple to understand but detailed enough to keep his interest, and there is enough strategy involved to keep us both focused. 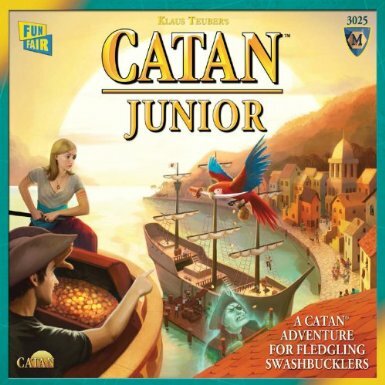 Catan Junior can be played with 2, 3, or 4 players, and the instructions recommend ages 6 and up. This has rapidly become our family's favorite game to play. I highly recommend Catan Junior!